Cast-Bronze Dolphin Money of Ancient Olbia, 5th to 3rd century BC. Olbia, on the shores of the Black Sea is now part of Ukraine. The ancient Olbians worshipped Delphinus, the sacred, playful fish-god of the sea. Before the introduction of struck circular coins, their cast-bronze coinage was crafted in the shape of a leaping dolphin. Sarmatia, Olbia. 5th century BC. 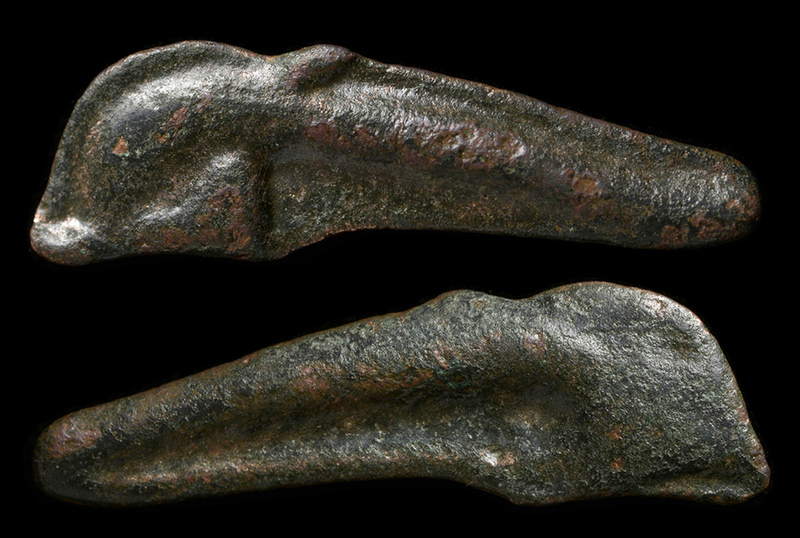 Bronze cast dolphin money, with pronounced fin, eye visible, and long beak. 21 mm, 1.50 g.
Olbian Dolphin type 1, 500-370 BC. The earliest style, with tall, arched body, small dorsal fin and groove down the side. Remains of Greek lettering around horizontal line on one side. Sarmatia, Olbia. 5th century B.C. Bronze cast dolphin money, with pronounced fin, eye visible. 23.7 mm, 0.83 g.
Sarmatia, Olbia. 5th century BC. Bronze cast dolphin money, with pronounced fin, eye visible, and long beak. 22 mm, 1.02 g.
Olbian Dolphin type 2: 370-300 BC. Interesting form with pronounced fins wown the spine. Large pronounced eye and intact nose. Sarmatia, Olbia. 5th century B.C. Bronze cast dolphin money, with pronounced fin. 23.6 mm, 0.84 g.